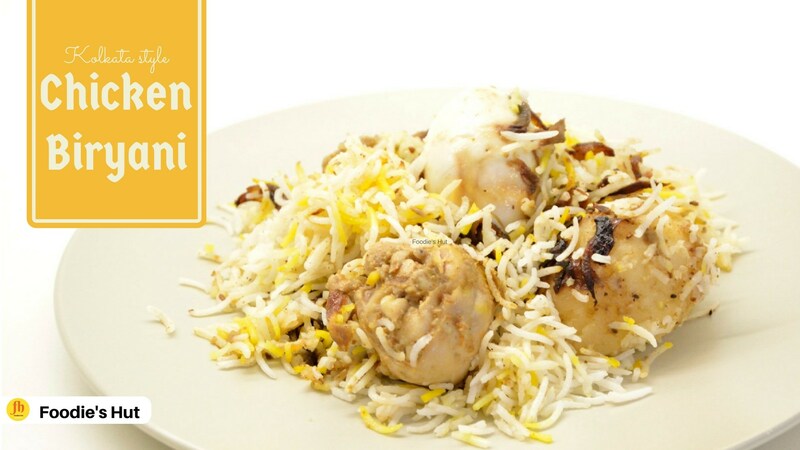 Calcutta or Kolkata style Chicken Biryani is a mixed rice dish inspired by Awadhi cuisine. 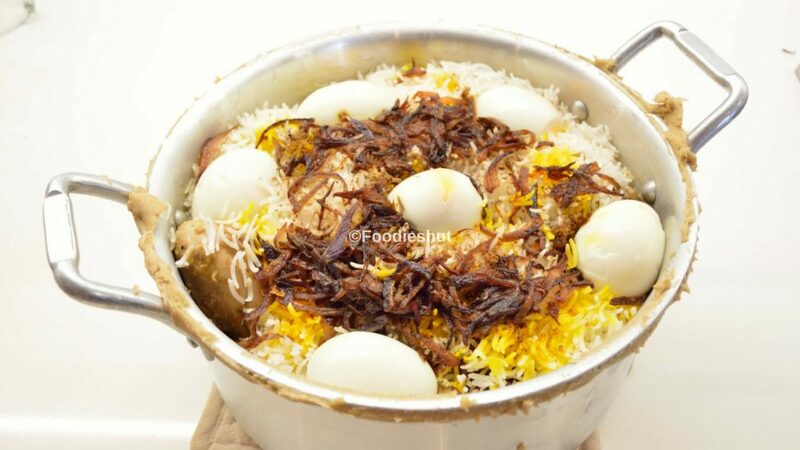 Biryani usually cooked with rice, Yogurt, meat and spices. Kolkata style Chicken Biryani is much lighter on spices and serving potato with meat is the specialty of Kolkata Biryani. 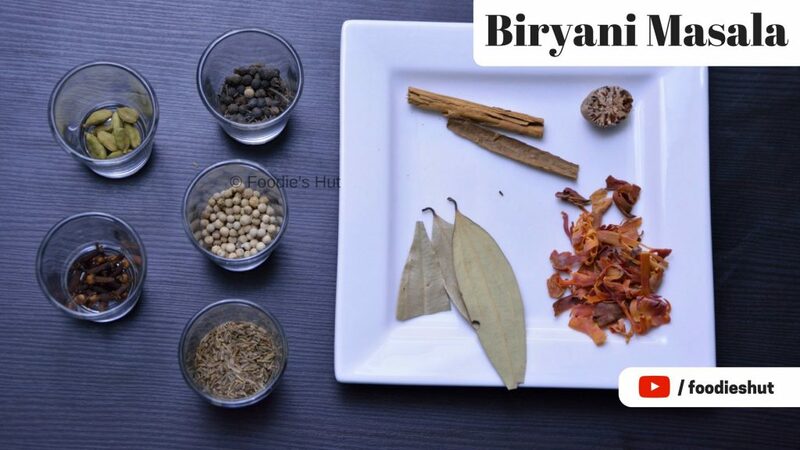 Nutmeg, Mace, Cinnamon, Cardamom, Saffron, rose water and screwpine water ( Meetha Attar) these are the quintessential ingredients for this Biryani. One can easily get Screwpine water (Kewda Water) or Meetha Attar in Calcutta or West Bengal, but it really hard to get outside the state. So if you don’t get in your locality, you can skip it. But, adding a few drops of Meetha Attar really make the difference. Place all whole spices on a preheated Tawa or Pan over medium heat. Give a stir for a few seconds and let them warm, remember your spices should be warm, not toasted. This will help to extract the aroma from the spices. Let them cool and grind. Add little bit Biryani Masala to the yogurt and with a help of a fork give a good whisk. Add onion paste, salt, ginger garlic paste,coriander powder, red chili powder, beaten yogurt. Give a good mix, cover it with a lid or plastic wrap and keep it in the refrigerator, at least for 2 hours, overnight is always better. Wash and soak the rice in water for at least half an hour, then drain the rice. Fill a pot with water and sprinkle a generous amount of salt. Add potatoes in it, make sure potatoes are cover with the cold water. Set the pan over medium-high heat and bring the water to a boil. Reduce the heat and simmer for 10-15 min, make sure the potatoes are 80% done, then drain the potatoes and let them cool. Preheat your Dutch oven and heat oil, when oil is hot, add sliced onion in batches and over medium heat cook for about 8-10 minutes to develop the brown color. then remove from oil and repeat the process for rest of the onion. Add boiled potatoes to the remaining oil and over medium high heat cook just for a minute to crisp the outer skin of the potato,then remove from oil. Add ghee to the remaining oil, let the ghee melt. Add whole spices to the hot oil and give a stir and then add in the marinated chicken. Over high heat cook just for a minute, and then reduce the heat to medium to medium-low and continue cooking until the chicken is almost 80% done, you need to stir the chicken a couple of times,just to make sure that it doesn't stick to the inner bottom of the pan. In a bowl, add rose water, kewra water, Mithe ator, give a quick stir and keep aside. When you see the chicken is almost done, add the potatoes, sprinkle Biriyani Masala and add essence mix,give a good stir to mix everything well and turn off the heat. In the same bowl again take rose water, kewra water, Mithe ator and a big pinch of Saffron. Give a stir and keep aside. Take another large pot with lid and fill the pot with water, sprinkle 4-5 Tbsp of salt, bring the water to a boil. Drain the rice and add half of lemon juice to the rice, give a mix. Once water start boiling, put rice in the water and add a few whole spices to the water, give a stir with a ladle and let it come up to a boil. Then reduce the heat to medium and cook for 2-3 minutes, the rice will be half cooked. Drain the cooked rice in a colander, I prefer to drain the rice in two colanders. Preheat your tawa over medium-low heat. Put one portion rice, then transfer the cooked chicken , sprinkle fried onion, the essence mix, add remaining ghee, Biriyani masala, another layer of rice, Biriyani Masala, remaining fried onion, mixed essence and add hard boiled eggs. Put the lid on and cover the side of the lid with the dough, so that steam can not escape, if you wish you can cover the pot with foil but I prefer to follow the good old process. This will not allow releasing the steam. Then place the pot on the preheated Tawa, and over low heat let it cook for 20 minutes. Then remove from heat and give five to 10 minutes standing time before serve. Enjoy with Raita and Salad. I am Shyamali, the content creator, the storyteller of Foodie’s Hut. I believe that home cooked food does not only fill the stomach with love but also fills us with our emotions and makes good memories. Every family has some unique recipes, these recipes created by the special people of the family, every ingredient, vegetable, spice and every detail of the method carries a unique taste with it, and one can feel the love that has gone into bringing a few raw ingredients to such a single dish.